8” and 12” smart home automation interfaces include voice control, plus IntelliVision® face recognition and high-resolution video. AMSTERDAM, NETHERLANDS — Nortek Security & Control (NSC), a global leader in wireless security, home automation, access control and health and wellness technology, today announced that it is now conducting live demonstrations of its two new ELAN® Intelligent Touch Panels that leverage face recognition and voice control technology at ISE 2019 in NSC Stand 1-N50. The new touch panels each integrate face recognition to control media, lighting, climate, shares, security and more. ELAN, from Nortek Security & Control LLC, develops an award-winning line of whole-house entertainment and control solutions distributed through a comprehensive channel of select dealers throughout the United States, Canada, and countries worldwide. 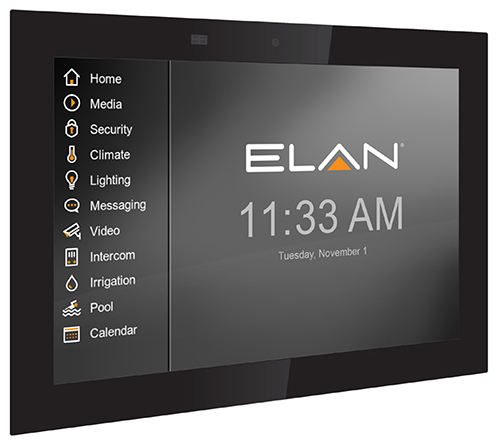 The ELAN 8 update was honored with the “2017 Human Interface Product of the Year” award, and continues to expand its intuitive functionality with security, climate, surveillance and video distribution products and integrations.